I can't believe it is December 1st. I can't believe there are only 24 days until Christmas. I can't believe that I have not slept more than five hours a night for the last several nights. And I can't believe that I haven't blogged for almost a week. It's not that I haven't had anything to blog about (that's happened before) but I swear I haven't sat down for days! I haven't even had time to read any of my favorite blogs. I try to at least glance through my blog roll first thing in the morning and visit at least one or two but that's even been difficult. 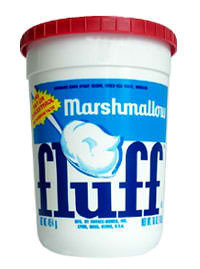 From my recent trip to the East Coast, I brought home a wonderful treat...a tub of Marshmallow Fluff! They may sell this wonderous treat in Indiana but I have never found it in a grocery store near me so I try to grab a tub (a small one) when I'm out visiting friends. Now, out East they also have wonderful rolls & bread (I think it's the Portugese influence) and I love eating this sandwich on a fresh roll. Yummy! So when I came home after my recent trip, I picked up some wheat rolls from the "marked down" bakery rack (Do you have a rack like this? It's a great thing.) and put one under the broiler before adding the PB and fluff...next time I may spread the fluff before it goes under the heat and see what happens. I've also been know to grab a spoonful of fluff and a handful of NutterButters and go to town. Marshmallow Fluff...a man-made perfect food! Something I also realized when I was out East is that those folks have a serious addiction...to Dunkin Donuts coffee! You can't go anywhere and NOT see more than one person holding a DD cup. The YMCA to watch a bunch of three-year-olds "play" basketball. The Pop Warner championship game to watch a bunch of nine-year-olds play football. Wal-Mart. The mall. This white stryfoam cup is EVERYWHERE! Wareham, Mass. certainly runs on Dunkin's. 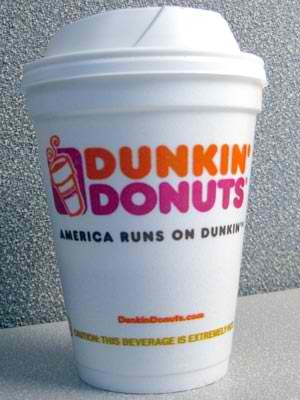 I miss having four Dunkin' Donuts within 10 minutes of me! They are hilarious. They are adorable. They are rotten. They are growing up way too fast. Enough said. I'm not the neatest person in the world. (OK, mom...quit laughing, you'll hurt yourself.) My house is messy. My car is messy. My office at work is messy. I'm messy! Add a real aversion to cleaning (and the love of a great deal) and you can imagine what my house looks like after a couple of busy weeks. Once my house gets to be too messy even for me, I try to clean in spurts. Usually I set a timer for 15 to 20 minutes and pick up until time expires. The other day I did a quick calculation of the total square footage of my 2-bedroom, 2.5-bath condo and determined that if I cleaned for 15 minutes a day, it would take me...OK I didn't really do the math. I hate math almost as much as I hate cleaning. Let's just say that it would take a long time. I did do a series of 15-minute sessions last weekend and didn't let myself get distracted by the TV or computer so my place isn't a disaster but I won't be hosting a party any time soon! After cheering the Pioneer Woman to victory again Bobby Flay on Throwdown, I decided to try my hand at the losing dessert...Bobby's pumpkin bread pudding. It looked delicious during the show. PW's own daughter endorsed it and then made it herself, so I thought "why not?" I wanted to make it for dessert on Thanksgiving. We were having sausage gravy and biscuits (well...we had hamburger gravy because there's beef - not pork - in the freezer...gotta love a farm family's freezer) for lunch. What...were we supposed to have something else on Thanksgiving? Sorry, I digress. Well...I didn't pull up the recipe until the morning I wanted to make it. I did bake a loaf of pumpkin bread (from a box) but I didn't realize all of the ingredients involved (11 egg yolks, brandy, half 'n half, heavy whipping cream). After a run to the grocery store, I was ready to start. Three hours and a water bath later, the dessert was done and half of the water bath was at the bottom of my mom's oven! I took ZERO photos of the process or the final product. It was a great tasting dessert but I'm not sure it was worth the effort...two runs through a strainer, just sayin'! Since my family didn't celebrate Thanksgiving on Thursday, I had some time on my hands. Walgreens and CVS were having some great sales and both were open on Thursday. So...I hit three different Walgreens and two CVS stores! I was going to post about all of my free and "better than free" deals, but...well you know. Now, did I need the eight tubes of toothpaste? Probably not, but I now have a bag of toiletries to donate to a local charity, a bag for my sisters and a bag to take in for my coworkers! I also got some great toy deals for the nephews and for an indian school that my office buys for each year. I love Christmas. I love Christmas music, movies and TV specials. I love Christmas shopping and gift giving. I love Christmas decorations...especially nativity scenes and snowmen. However, I don't do a lot of holiday entertaining and it seems like a lot of effort to decorate my house just for me. I didn't decorate last year and the only snowman decoration that I put out last year is STILL on my mantle (he's very small). There are some great giveaways out there on some of my favorite blogs. I'm not going to mention them all here, but Little Miss Can't Be Wrong is hosting a fun one over at how i met your father. She's giving away a beautiful "Key to your Heart" necklace. Go over there and check it out. If you decide to comment, please let her know that I sent you! WHEW! I feel better now. Hopefully, I won't go so long without a post again. I didn't realize how much I enjoyed my "blogging time" both writing my own and reading others. I think I'll go to bed now. Maybe I'll get six hours of sleep tonight! P.S. I am messier and have a housekeeper that can't keep up with my mess making. "OK I didn't really do the math. I hate math almost as much as I hate cleaning. Let's just say that it would take a long time." RAH for marshmallows! If they make them any bigger, maybe we could just curl up in one and it would absorb us for a nice ling winter's nap! A girl can dream, then wake up, and eat herself out of the shelter right? wow -- so MUCH going on! thank you for posting about my giveaway!! and i'm glad you got some fluff. that's a staple at our house, in fact... i have peanut butter and fluff on potato bread for lunch today!! when you run out, if you need someone to send you some more i'm your girl! !